There, I’ve done it again: I found another usage guide at our local (Dutch!) charity shop Het Warenhuis. How did the book end up in the Netherlands? There is no ownership inscription unfortunately, so we won’t know who the former owner was. But more seriously, who is the author, Harry Blamires? Googling for him brought me to Wikipedia, where it can be read that he was born in 1916, and that he is a (now retired) theologian, literary critic and novelist. And also that he was formerly head of the English department at King Alfreds College (Winchester University today) in Winchester, in English. But the entry doesn’t mention the title of my new book. 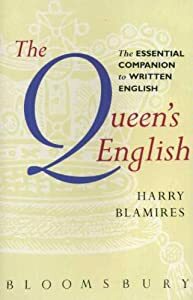 The HUGE database includes another book by Harry Blamires, The Queen’s English, published in 1994 by Bloomsbury. My book came out even later, in 1998, published by BCA (Book Club Associates: thanks to Tim Waller for pointing this out!). Were both books written by the same Harry Blamires whose first publication, according to Wikipedia, was a novel called Devil’s Hunting Ground (1954), who wrote guides through James Joyce’s Ulysses and T.S. Eliot’s Four Quartets, as well publishing a book called Recovering the Christian Mind: Meeting the Challenge of Secularism (1988)? 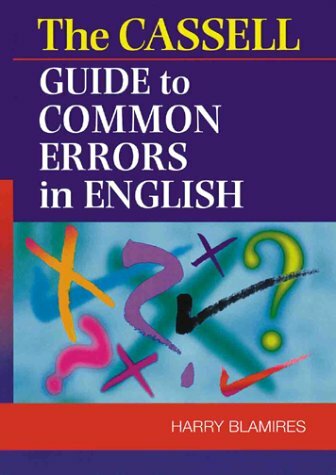 Please help us identify the author of The Cassell Guide to Common Errors in English and of The Queen’s English. Ideally of course, we would like to get in touch with the author himself. Thanks to Harry Blamires’ son, Cyprian Blamires, for telling us that his father is now 98! This entry was posted in biography, usage guide and tagged Harry Blamires. Bookmark the permalink. 8 Responses to Who is Harry Blamires? Regarding BCA, are you absolutely sure it stands for Burnidge Cassell Associates here? Maybe it does, but from the title of the book, I’d have thought the publisher was Cassell, which was swallowed up by Orion a few years ago. You probably already know this, but BCA quite often stands for Book Club Associates, a mail-order book club that produces its own editions of books, with its own name on the spine (or at least pays the publisher to do so). I’m not familiar with the author, but I see from AbeBooks that he’s also the author of The Penguin Guide to Plain English and Compose Yourself and Write Good English. There’s something on the Penguin website about him. Thank you for your point, you are quite right to doubt me. I did think of Book Club Associates at first, but in my copy of Partridge’s Usage and Abusage, their name is spelled out in full. Also, the logos are different. Thank you for the reference to the Penguin website. I’ll have a look. But we are still waiting for a reply from the author himself! Tim, I concede defeat (as they say): you are absolutely right. I just looked up the Book Club Associates in Wikipedia, where a different logo is given from the one you describe in your comment, and which I was familiar with. It is the same one which occurs on the title page of my copy of Blamires’ book! Thanks for your help in this. The Penguin website suggests that it is the same man. I have just come across your discussion of Harry Blamires. Currently aged 98 and living in a Home. Many thanks for getting in touch with us, Cyprian: apologies for the error in the post, which has been corrected. I hope you will tell your father that we admire his work, and that his book on usage plays a role in our research on usage guides. Dear Cyprian, Purely by chance I came across your name in this 2014 article and recalled meeting you in Oxford, probably around 1968. You were a very good friend of my late brother, Adrian, who you probably know died in his mid 30s as the result of an RTA. Anyway, strange how something from the past can crop up.